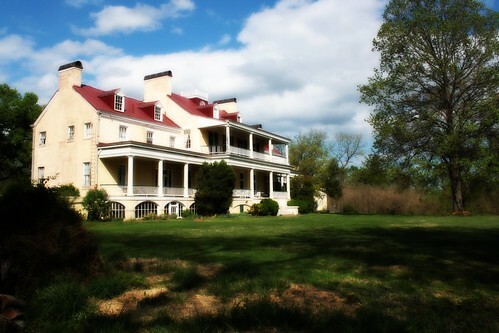 Claymont Mansion, near Charles Town, WV. Photo courtesy of Troy Tolley. When I was younger, I spent a lot of time visiting my aunt and uncle, who lived within walking distance of our house. My aunt was always a barrel of fun. She would play endless games of Trivial Pursuit and Monopoly with me, always had some sort of curiosity to show me when I would visit, and would lend me her encyclopedias when I was curious about a topic. One project I fondly remember working on her with was the “blueprints” for my dream home. It covered eight sheets of paper, with each sheet representing a floor. Yes, the house was seven stories tall. It featured an elevator to help take people from floor to floor, as I wanted it to be handicap-accessible. It featured somewhere around sixteen bedrooms, a library that would have been somewhere around 2,000 square feet in size, and countless other features. It had a six lane bowling alley in the basement. All told, the house would have measured around 28,000 square feet of floor space, as each floor would have taken up about 3,500 square feet and there were eight floors. This was my dream house. It had everything I could imagine that I would ever want in it. Who could want anything else? Over the past few years, Sarah and I have been sketching out our actual dream home. It’s actually surprisingly small, maybe only a few hundred square feet bigger than our current home. The bedrooms are slightly larger, and there’s an additional bedroom so each of our children can have their own room. There’s a small office for writing. The kitchen is perhaps slightly bigger. There’s one less bathroom and the family room and living room are essentially merged into one. We’ve discussed a few other optional things, such as a game room/library, but every time we think about an addition, we find ourselves thinking about the time we’d have to spend maintaining that extra space and the time we’d have to work paying for the extra heating and cooling, and we find ourselves realizing that we’ve already designed the house we want. What’s far more important to us is location. We want to live in a rural area surrounded by trees, but with enough open space for our children (and eventual grandchildren) to have space to play in. We’d like to have a small barn or a large shed for storage of garden implements, a snowblower, and other such items. We want to live relatively near our family and closest friends. Dreams change. Goals change. People change. The ideas we hold onto in our childhood transform into the dreams of our teenage years. Those blossom, too, into the ideals of early adulthood, and again shift as we approach middle age. I fully expect my dreams to shift again as my life continues forward. How do you plan for these ever-shifting dreams? If the big elements of our lives are so open to change and transition, how can we ever really plan for anything? One major step a person can take is to keep their plans and preparations for their goals as multi-purpose as possible, particularly in the early stages. If you’ve started moving toward a goal only to find out that, as you grow older, that goal no longer has appeal, it’s useful to find that your preparation actually has use in other areas. How do you make that happen? Minimizing your financial obligations is one part of that. A solid financial foundation makes almost any goal easier to achieve. If you don’t have any debts, your monthly bills are going to be much lower than those of a person with debts. Lower monthly bills means that you need less income in order to survive, which means you’re going to be more able to jump on board the opportunities that come along. Hand in hand with minimizing obligations comes maximizing cash on hand. This means saving up your nickels and dimes, whether in a savings account or in other forms of investing. As always, the more resources you have to draw on, the easier it is to achieve your goal, whatever it might happen to be at the time. You should also stock yourself up with a wide variety of transferable skills. Transferable skills are ones that people find themselves using over and over in life, no matter what the situation. They range from things like public speaking and written and verbal communication skills to abilities like plumbing and carpentry. The more skills you have like these, the easier it will be to achieve anything in life. Another key asset is a large and diverse social network that you keep in contact with. By “in contact,” I don’t mean just friending on Facebook and then ignoring. I mean actually connecting with them on a regular basis by asking them how they’re doing and what they’re up to. Even better, when you have an opportunity to help someone out, just do it. That kind of goodwill is invaluable when you’re working towards a goal – and you might just find that the unexpected people are the ones with the keys to the kingdom when you refine your goals later in life. The dreams you had as a child have changed as you’ve grown into adulthood (at least, they have for almost all of us). Those dreams are likely going to change again as you move through your life. Just because your dreams change doesn’t mean that dreams are unreachable targets or that it’s a waste of time to prepare for them. It simply means that you should spend your time building a firm and solid foundation of finances, relationships, and skills so that when the right chance comes along, you’re able to jump on board and live out your dreams.